President Obama on Wednesday night shared a beer with former Cpl. Dakota Meyer at the White House, the evening before presenting Meyer with the Medal of Honor. The White House said the meeting took place on the patio outside of the Oval Office. Meyer will receive the military’s highest award, the Medal of Honor, for charging five times through heavy gunfire to rescue comrades ambushed by insurgents in Afghanistan in September 2009. The ceremony will start at 2:30 p.m. EDT today at the White House. 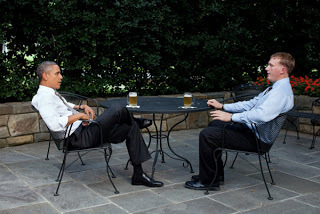 Photo credit: Pete Souza / White House President Obama shares a beer with Dakota Meyer on the patio outside of the Oval Office on Sept. 14. Meyer is scheduled to receive the Medal of Honor on Sept. 15.